writing Archives – Paul DeBlassie III, Ph.D.
Ahhh…to fall deeply in love with soul—not many have considered it. So few have discovered it. It remains a central need for us. We so easily become soulless, lose soul. There’s tiredness that won’t go away. There’s a vague sense of unhappiness lurking like a shadow. There’s that quality to life that it’s not wholly satisfying. These are symptoms of soul loss. I’m preparing for vacation with Kate. We’re off to a secret place of new sites, smells, tastes, time together. We dwell on the past year, what’s new that we’re seeing in the places we visit. It’s a time of reflection, absorbing, and experiencing. Most of all, it’s a time of being together. Doing depth psychotherapy and writing every day is consuming. Your work-a-day life is consuming. Life takes a lot. And, life can give a lot. But, soul is required. If we’re moving too fast, having lost enjoyment because of the speed at which we live, then there’s soul loss. We’ve fallen out of love with soul. When I write, and when I do psychotherapy, I love what I do. When I prepare for vacation, I love the anticipation and the getting there. And, once I’m in the doing of what I’m doing, there can be utter joy. That is soul. 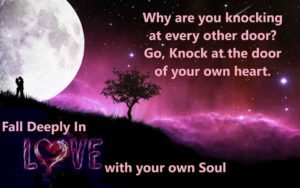 That is falling in love with soul and a soulful life. The visionary fiction I write dramatizes soul. There are people who’ve lost it or come close to losing it. They feel crazy or on the verge of crazy. When we get to the edge of sanity, we teeter and totter. Oh, it’s a very scary time. Sometimes the teetering goes on and on. We feel ill inside, lost and empty. Physical sickness strikes. Mental anguish bears down and won’t let up. The characters in my stories struggle with what it means to be a woman or a man living with pain from the past and abusive people in the present. What do you do? You can’t run from the past forever. You can’t pretend the toxic people in your life now aren’t as bad as they seem. They are. And the truth of what they are and how you play into what they do has to be faced. This is a visionary story—intense, loaded with choices that make the difference between soul and soullessness. I do therapy and write and live from what I know and have gone through. If I didn’t my patients and readers would feel it. Instead, I’ve been told that what I’ve offered makes sense and helps hurting souls. I’m glad for that. The past week doing therapy has been tough, and I’ve given it my all. The past year nurturing two books in visionary fiction with another on the way has been hard work. I’ve given everything workwise my all. Even more importantly, I’ve given my personal life my all. At least, I believe and hope that I have. There’s been a lot of going through rough times and coming out the other end mentally and spiritually more clear and with sharpened consciousness. Doing therapy and doing writing, living as authentically as I can in my marriage and with my family, has been my priority. Take some time this summer to make falling in love with soul your priority. You and I can do it by slowing our roll and taking in the joy of being with those we love. We can do it by slowing our roll and reading what nourishes us. Read with deliberation, care, letting the words and meaning of the story settle in like a good meal. On vacation, I like to slow our roll, not move fast and furious. I’m taking a beautiful visionary book, Pedro Paramo by Juan Rulfo. It’s a classic in the genre of magical realism. Acclaimed as a masterpiece of the surreal, it’s a story of one man’s quest for heritage and soul. Tormented spirits share secrets from the past. I’m going to take my time with this read. I’m going to take my time with my wife, Kate, the sites we see, the moments lingering together. Falling in love with soul, for me, always means falling in love all over again with so much. What is right before me and with me every day comes once again to light. I realize how scary it is to lose sight of life and soul by living so fast and in such a demanding way. So, let’s take time together, live a little slower, read a little slower, and fall in love with soul.